Waste Prevention & Minimisation: Australia - Bottled water BANNED! Australia - Bottled water BANNED! Australian state New South Wales Premier Nathan Rees has announced an immediate ban on all departments and agencies buying bottled water, including supplies for water coolers. It was the first step in a Government campaign to reduce significantly the consumption of bottled water in the community, Mr Rees said. In a double blow for the bottled water industry, the sleepy Southern Highlands hamlet of Bundanoon voted to ban bottled water, just hours after the NSW Government announced its boycott. "These plastic bottles are everywhere," Mr Rees told reporters yesterday. "It's not just the direct plastic bottle that causes the physical reality in our local environment. "Bear this in mind. You take a 600ml plastic bottle, 200ml of oil has gone into its production. "That's leaving aside the C02 that comes from transporting it around the place. "Bottled water has been banned in ministerial offices at Governor Macquarie Tower in Sydney's CBD since Mr Rees became Premier last year. At a community meeting last night, Bundanoon locals overwhelmingly supported Australia's first ban on commercially bottled water, already agreed to by businesses in the town. Local businessman and Bundy on Tap organiser Huw Kingston said almost 400 people turned up to the Bundanoon Memorial Hall, with only two casting dissenting votes. The Age reports that the voluntary ban has been triggered by concerns about the carbon footprint associated with bottling and transporting the water. Free water fountains will be installed in the NSW village, south-west of Sydney, to replace the bottled water. "It was the biggest ever turnout in the community here at Bundanoon - it's overwhelming support," Mr Kingston said. "We can now continue with our route of making Bundanoon Australia's first bottled water-free town. We can go forward with the strength of the community and the businesses right behind us." 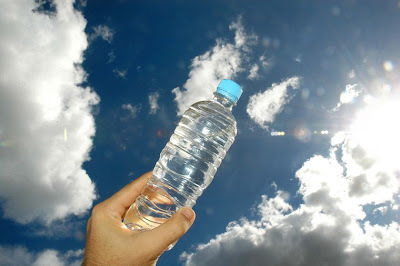 Australians spent about $500 million on bottled water in 2008, a 10 per cent increase on 2007. "It's all about common sense," Do Something! director Jon Dee said. "When you reduce the usage of bottled water you're not just saving the environment, you're also saving your wallet at the same time. "It makes total sense whether you're a government department or whether you're a company, whether it's in smaller bottles or the larger bottles that get delivered to offices. "Mr Dee said it made no sense for people to pay twice as much for a litre of bottled water than for a litre of petrol." The bottled water industry has managed to convince people that bottled water is somehow pure or better for you than water you drink out of the tap," he said. "But we have among the best tap water in the world." But Geoff Parker, director of the Australasian Bottled Water Institute, which represents the industry, said he was disappointed by the bans. Both restricted consumer choice, he said. "The environmental footprint of one bottle of water of locally produced water would be much smaller than a tin of canned tomatoes imported from overseas, some imported cheese, or French champagne," he said. "I think we need to keep it in perspective."